The amazing Rik Van Bruggen shows in this short video how to easily style and query the publicly hosted World Cup Database. We'll add more as they're organised. If you'd like to host one please get in touch! You can email Mark or Michael directly. In our previous post we mentioned a graph gist containing a data set of World Cup matches but didn't go into any detail about what the World Cup Graph looks like. 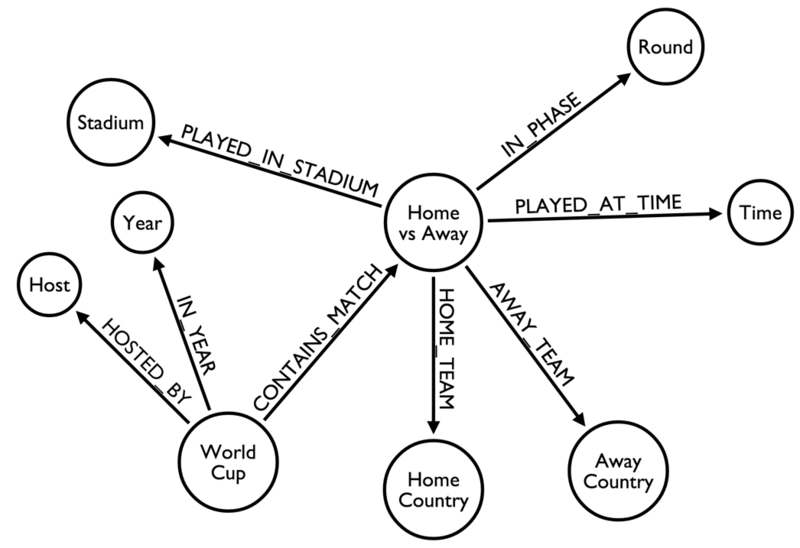 The World Cup sits at the centre of our graph and contains relationships to lots of meta data. At the moment not much is going on around matches but the intention is to introduce player data into the graph which will change that. World Cup Quiz - test out your cypher skillz! In time for the World Cup we've created a little quiz with some questions that you can discover the answer to by writing cypher queries against our World Cup graph. You can either download the data set and write queries on your local Neo4j instance or just fork the graph gist and work on it online. We also prepared a readonly instance of the database online on GrapheneDB which you can use for querying here. Just make sure you adapt the styling of the graph-visualization. Neo4j is creating a World Cup data set which includes historic data and relates world cups, matches, players, countries, stadiums and more. Neo4j meetup groups around the world will create GraphGists to extract insights and/or extend the model to make it even more interesting. On Wednesday 18th June the Neo4j Amsterdam group will join the party as part of their Graph Cafe football special. You can sign up on the meetup.com page. You'll even be able to watch the Holland vs Australia match before the event gets underway. On Thursday 8th July the Neo4j San Francisco group will join the party. You can sign up on the meetup.com page. Neo4j meetup groups around the world will create GraphGists to extract insights and/or extend the model to make it even more interesting. We want to participate with an all-indian meetup on this topic. With World Cup 2014 just around the corner we thought it'd be fun to build a Neo4j graph all about the World Cup. This will be an open graph that everybody can explore and help evolve. To get us started there's already a graph gist published which has a model containing all the matches, stadiums, hosts and more. We'll organise hackathons in different countries to build on top of this starting with one in the Neo4j London office on 18th June. Please sign up on the meetup page if you want to attend.